The first and second auctions are just classic and totally awesome M.U.S.C.L.E. auctions. 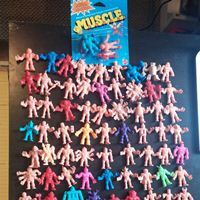 The first auction, Lot of Vintage M.U.S.C.L.E. Men 80 loose & 1 MOC Pack of 4 1985 Mattel Wrestlers, is starting at $0.01 and features 80 figures plus a 4-pack. This is the best way to sell M.U.S.C.L.E. figures. 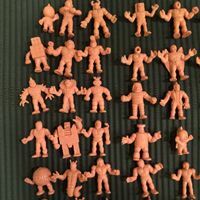 The second auction, M.U.S.C.L.E figures LOT (Over 100 Plus Some Colored guys). , is in the same boat as the first. Over 100 M.U.S.C.L.E. figures starting at only $0.99. The main auction picture is a bit misleading, but that is the only possible negative aspect of this auction. 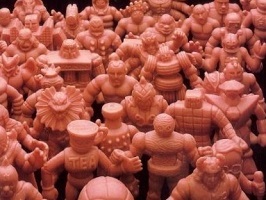 The third auction, Lot of vintage M.U.S.C.L.E. 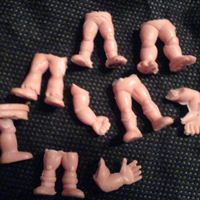 Men 1980s arms and legs bits for making custom guys, is simply fascinating to see. In-progress custom M.U.S.C.L.E. figures are very rarely seen. The only thing that is seen even less often – the extra pieces. Whether there is actually a market for these types of auctions doesn’t matter. This is just a fun and interesting auction. 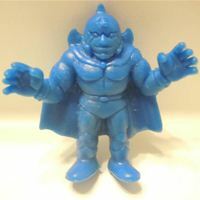 The fourth auction, M.U.S.C.L.E Kinnikuman Y/S.N.T Dark Blue Akuma Kishi #92 Class A Mini Figure HTF, highlights the classic Class A phenomenon. Just because a figure is a Class A doesn’t mean that it deserves a premium. Could this figure still sell? Yes, of course. A Master Set collector might try and snipe it at the end. However, a genuinely desirable Class A figure clearly labeled like this one will get an opening bid – even when it’s badly overpriced. This is probably one of the roughly $20 Class A figures. This entry was posted on Thursday, June 5th, 2014 and is filed under Auction Watch, UofM News. You can follow any responses to this entry through RSS 2.0. You can skip to the end and leave a response. Pinging is currently not allowed. Dark Blue #92 was listed for $88.88 and there were no bids. It ended up selling for $6.49 with two bids.